Buying Your Next Computer ... What to Do? You have had your computer for many years now and then you finally wake up one day say that it is time for a new computer. It could be because you turn on your existing computer and it is extremely slow browsing the web. It could be because your computer sounds like a train when you turn it on. It can be because your spouse just got a new handy dandy tablet and now you need one too. So ... you are in the market for a new computer. What do you buy? What do you need? Today's day and age, their are just simply so many options out there. Everywhere you go someone has some sought of computer device out there. Buying computers can be an overwhelming experience. There are so many varieties to choose from. There are tablet computers, laptops, and desktop computers. Then there are choices between Apple's operating system and a Windows operating system, or even a Chromebook. There are so many choices to decide between, that it can be difficult to choose. You will need to consider a few things before making this decision. The most important thing is to decide what you need your computer for. Some computers are better for gaming purposes, while there are also options for just the basic user. How will you use your computer is the biggest consideration. Then you will want to consider your budget, because there is a wide spectrum of price ranges within each category. Do you need something with portability or is a stationary computer fine? It will take a lot of time to help you decide on which is the best option for you. Laptops - Laptops contain the entire computer into one compact and portable option. Laptops can vary greatly in price, depending on the needs. Gaming laptops are significantly more expensive than laptops that are just used for traveling. Many laptops allow the hardware like memory to be expandable thus increasing the performance to keep up with changing technology. It is also nice because you can run pretty much the same programs that are on a desktop. These can be used for heavy duty work on the go as well as a desktop. Ultrabooks - Ultrabooks are basically the same thing as regular laptops, with the body being much slimmer than a traditional laptop. They will be more expensive as a result, but they run at the similar performance of traditional laptops with the same specs. Ultrabooks are great for portability, as some laptops can be a little clunky. However, they can be excellent for everyday tasks and competent for low-to-mid-range gaming and extremely competent for most of what people do for work, but it's really lacking when it comes to video encoding, graphics rendering, and crunching large sets of data. 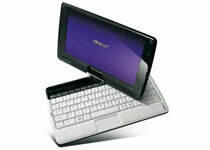 Netbooks - Netbooks are another portable option, similar to a laptop. The difference is that netbooks are generally more basic and smaller than traditional laptops. This makes them the least expensive option even compared to a ultrabook. You will not be able to run alot of standard software on these like Microsoft Office, word, excel.. etc... Great for travel, but lacks the processing power and ability to do what a laptop and ultrabook can do. So you may not be able to support your clients if that is the purpose. Make sure you test out the netbook before you buy. Tablets - Tablets are the current rage right now. They are portable touch screen devices that rely on an operating system that is specific to the tablet, similar to a smartphone. Rather than actual software, most tablets use apps just like you would find on your smartphone. These can run around the same price as netbooks and lower end laptops. They generally do not use Windows operating system and will not run standard windows software. Typing can be a little difficult instead of a standard keyboard. Desktop Computer with a Tower - A desktop computer that comes with a tower will need a separate tower, monitor, mouse and keyboard. This allows for you to customize your computer with exactly what you want and need. This is also up-gradable, so if a part goes bad you can just replace the part rather than the whole tower. You will get more for your money with a desktop in regards to computer power instead of a laptop. It is easier to keep up with technology at a lower cost with a desktop and allow for more customized hardware options. All-in-One Desktops - All-in-One computers are just like desktops with towers, but all the components and the monitor are in one convenient location. This helps to reduce the amount of desk space needed. A little big to be considered a laptop so they aren't nicely portable. One drawback is with regards to upgrade-ability unlike a normal desktop. Also if something breaks, like a laptop, the whole unit needs to go in for repair. These can get pricey but can also look very stylish. Now that you know what your choices are, you need to decide what you need and how much you are willing to pay for it. If you are just a casual user that is looking for just something to check emails or social media and news, than you can really just pick the cheapest option and be okay. If you are a gamer that wants something powerful to perform well when gaming, you are going to spend a substantial amount more. Give yourself a budget, and work within that to find the computer that you need and want. For the basic user, a great option can be either a tablet or a netbook. These are inexpensive and basic options that you can take with you on the go. You also can consider a desktop computer if you have the space, but you do not need a lot of bells and whistles and you will likely not spend a lot. If you are a college student, a laptop or an Ultrabook are great choices. These offer great portability so you can take it to class or to the library to do work, as well as taking it home to work on projects. You will need to consider hard drive space, especially depending on your major. They also have gaming laptops that you can choose from for work and play while in college. If you someone who wants a computer for the home or a gamer that does not need a portable option, the tower desktop is your best option. The basic at home user does not need to spend a lot on their desktop, and can really go with an inexpensive and basic option. A gamer will also appreciate how customizable and upgradeable desktops are. With a desktop, you can upgrade the video card when you want to keep up with your games without having to purchase a whole new system. Good luck in your next computer search!